With a day’s notice, I decided to go to Southern California to celebrate my dad’s 79th birthday. For the past week he’d been mostly at home, recovering from a leg injury, and I thought he could use some company and a fuss for his birthday. 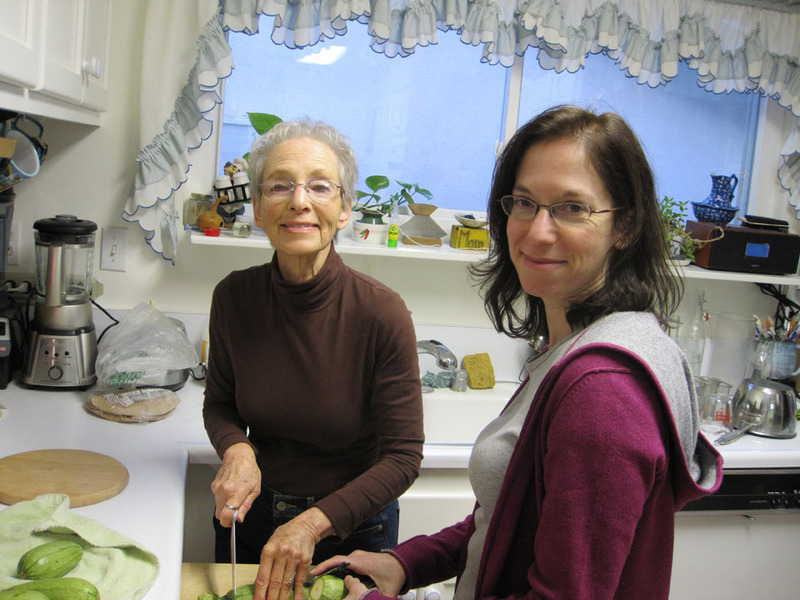 It’s also been awhile since my mom and I tore it up in the kitchen, and I was looking forward to that, too. People who don’t live in California think that when I go to there for a visit with my vegan parents that we mostly eat avocados and oranges off the trees. We did have very sweet tangerines from my brother Chuck’s tree, and then dined at some lovely vegetarian cafes, and then got to work in honor of dad’s birthday. My mom is a very skilled and quite fearless cook, which makes these cooking visits so enjoyable. She likes bold flavors and well-seasoned food, and has great ideas about what goes with what and encourages my crazy ideas (not represented in this particular post). She’s also tireless, and thinks nothing of cooking for hours at a stretch, so she was enthusiastic about making this menu together. I’m a big fan of chickpeas in any preparation, and especially like them combined with zesty spices. We were inspired by the hummus cake recipe from Vegetarian Times, which morphed into this recipe. We served them with a walnut sauce and caponata, but they are a nice base for nearly anything. While my parents and I were out shopping, we discovered fresh chickpeas at the Middle Eastern market (who knew? I thought chickpeas only came in a can! They cook up to a brilliant green and have a creamier texture than their dried version). Dad offered to peel them, and didn’t complain when his hands turned black, and so we also cooked those up. Heat oven to 350. Measure out 2 1/4 cups chickpeas (set the rest aside) and put in a food processor. Add green onions, tahini, lemon juice, olive oil, garlic, spices, and salt, and process until coarsely chopped and combined. Move the mixture to a large bowl, and stir in the rest of the chickpeas. Taste the mixture and adjust seasonings. Lightly brush a baking sheet with oil or use a Silpat mat. 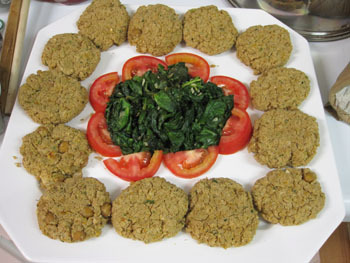 Shape chickpeas into small patties. We made about 18. They don’t hold together if you make them burger size, so don’t make them that large. Put them on the pan and lightly brush the tops with oil. Bake for 30 minutes and serve warm or at room temperature. Serves 6. Put into food processor: walnuts, onion, garlic, salt, pomegranate molasses, half the cilantro, and the spices. Pulse mixture until well chopped, but still a bit chunky. Heat olive oil in medium skillet over medium heat. Add mixture and cook, stirring, until darker in color, about 10 minutes. Remove from the heat, add in remaining cilantro, and serve warm or at room temperature. Use a vegetable peeler to make thin strips out of the zucchini. It’s OK if the strips are not all exactly the same size or perfect looking. Cut the pepper into thin steps. Heat a nonstick medium sized skillet over medium high heat. 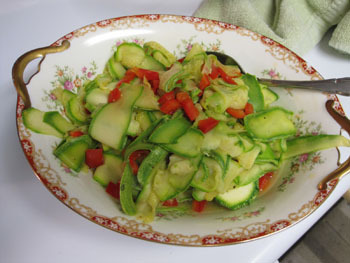 Add a tablespoon of water, and the zucchini and pepper. Saute until the vegetables are soft, about 10 minutes, but watch carefully so you don’t overcook them. Remove from the heat, add salt and pepper to taste, and serve. My brothers Chuck and Gregg came over for the dinner and then artfully presented Dad with all kinds of interesting gifts and garlic. We had ambitious plans for Dad’s birthday dessert. But after also making a quinoa tabbouli and spinach saute garnish, and another sauce that didn’t get a passing vote, we decided to indulge in the Purely Decadent coconut milk ice cream that we picked up earlier that day. Happy birthday, dad! 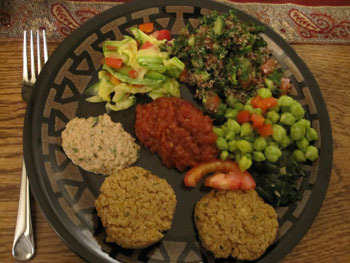 This entry was posted in Middle Eastern, vegan and tagged chickpeas, Middle Eastern, vegan by Amy. Bookmark the permalink.